For other uses, see Kars (disambiguation). Clockwise from top left: The Cathedral of Kars; Castle of Kars, panoramic view of Kars. Kars (Turkish: Kars, Ottoman Turkish: قارص‎, Armenian: Կարս, less commonly known as Ղարս Ghars) is a city in northeast Turkey and the capital of Kars Province. With a population of 73,836 as of 2011, it is the largest city along Turkey's closed border with Armenia. (As of September 2018, Turkey maintains that the border will remain closed until Armenia ends the occupation of Karabakh region). For a brief period of time it served as the capital of the medieval Bagratid Kingdom of Armenia. The seat of an independent Armenian Kingdom of Vanand during the 9th and 10th centuries. Its significance increased in the 19th century, when the Ottoman and Russian empires contested the possession of the city, with the Russians gaining control as a result of the 1877-78 war. During World War I, the Ottomans took control of the city in 1918 and declared the Provisional National Government of the Southwestern Caucasus (promulgated 1 December 1918), but ceded it to the First Republic of Armenia following the Armistice of Mudros (signed 30 October 1918). During the war in 1915, Turkish revolutionaries captured Kars for the last time. TheTreaty of Kars, signed in 1921 by the Government of the Grand National Assembly and by the Soviet republics of Armenia, Azerbaijan and Georgia, established the current north-eastern boundaries of Turkey. The treaty included de jure provisions guaranteeing the Armenian residents right to relinquish Turkish nationality, leave the territory freely and take with them either their goods or the proceeds of their sale, but by some accounts formerly Armenian lands had de facto become state property as a consequence of the treaty,. In 1945 Soviet Foreign Minister Vyacheslav Molotov rejected the treaty. As Chorzene, the town appears in Roman historiography (Strabo) as part of ancient Armenia. For the origin of the name "Kars", some sources claim it to be derived from the Georgian word კარი (kari), meaning "the gate" as was the case for other border region strongholds while other sources claim it is from the Armenian word հարս (hars), meaning "bride", or rather from կառուց բերդ (kaṛuts berd), "Kaṛuts Fortress". The Turkish etymology offered by M. Fahrettin Kırzıoğlu (that the name came from the "Karsak", a Turkish tribe), has been dismissed as unsustainable by scholars. The 10th-century Armenian Church of the Holy Apostles, as seen in a photo taken in the late 19th century. The Map of Armenian Kingdom under the Reign of Bagratid Dynasty, 10-11th centuries A.D.
Little is known of the early history of Kars beyond the fact that, during medieval times, it had its own dynasty of Armenian rulers and was the capital of a region known as Vanand. Medieval Armenian historians referred to the city by a variety of names, including "Karuts' K'aghak'" (Kars city), "Karuts' Berd", "Amrots'n Karuts'" (both meaning Kars Fortress) and "Amurn Karuts'" (Impenetrable Kars). At some point in the ninth century (at least by 888) it became part of the territory of the Armenian Bagratunis. Kars was the capital of Bagratid Kingdom of Armenia between 928 and 961. During this period the town's cathedral, later known as the Church of the Holy Apostles, was built. In 963, shortly after the Bagratuni seat was transferred to Ani, Kars became the capital of a separate independent kingdom, again called Vanand. However, the extent of its actual independence from the Kingdom of Ani is uncertain: it was always in the possession of the relatives of the rulers of Ani, and, after Ani's capture by the Byzantine Empire in 1045, the Bagratuni title "King of Kings" held by the ruler of Ani was transferred to the ruler of Kars. In 1064, just after the capture of Ani by Alp Arslan (leader of the Seljuk Turks), the Armenian king of Kars, Gagik-Abas, paid homage to the victorious Turks so that they would not lay siege to his city. In 1065 Gagik-Abas ceded his kingdom to the Byzantine Empire, but soon after Kars was taken by the Seljuk Turks. The Seljuks quickly relinquished direct control over Kars and it became a small emirate whose territory corresponded closely to that of Vanand, and which bordered the similarly created but larger Shaddadid emirate centered at Ani. The Kars emirate was a vassal of the Saltukids in Erzurum, whose forces were effective in opposing Georgian attempts at seizing Kars. Thus, it was only in 1206 that Zakare of the Zakarids-Mkhargrzeli succeeded in capturing Kars, joining it to their fiefdom of Ani. It was conquered in 1242 by the Mongols; was regained by Georgian Kingdom during the reign of George V the Brilliant (1314–1346), it remained part of the Kingdom before its disintegration, which then passed into the hands of Georgian Atabegs belonging to the House of Jaqeli. In 1387 the city surrendered to Timur (Tamerlane) and its fortifications were damaged. Anatolian beyliks followed for some time after that, until it firstly fell into the hands of the Kara Koyunlu and subsequent Ak Koyunlu. After the Ak Koyunlu, as it went naturally for almost all their former territories, the city fell into the hands of the newly established Safavid dynasty of Iran, founded by king Ismail I. Following the Peace of Amasya of 1555 that followed through the Ottoman-Safavid War of 1533-1555, the city was declared neutral, and its existing fortress was destroyed. In 1585, during the Ottoman-Safavid War of 1579-1590, the Ottomans took the city alongside Tabriz. On June 8, 1604, during the next bout of hostilities between the two archrivals, the Ottoman-Safavid War of 1603-1618, Safavid ruler Abbas I retook the city from the Ottomans. The fortifications of the city were rebuilt by the Ottoman Sultan Murad III and were strong enough to withstand a siege by Nader Shah of Persia, in 1731. It became the head of a sanjak in the Ottoman Erzurum Vilayet. In August 1745, a huge Ottoman army was routed at Kars by Nader Shah during the Ottoman-Persian War of 1743-1746. As a result, the Turks fled westwards, raiding their own lands as they went. The 1828 Russian siege of Kars (painter January Suchodolski). In 1807 Kars successfully resisted an attack by the Russian Empire. During a break between the Russian campaigns in the region conducted against the Ottomans, in 1821, commander-in-chief Abbas Mirza of Qajar Iran occupied Kars, further igniting the Ottoman-Persian War of 1821-1823. After another Russian siege in 1828 the city was surrendered by the Ottomans on June 23, 1828 to the Russian general Count Ivan Paskevich, 11,000 men becoming prisoners of war. At the end of the war it returned to Ottoman control for diplomatic reasons, Russia gaining only two border forts. During the Crimean War an Ottoman garrison led by British officers including General William Fenwick Williams kept the Russians at bay during a protracted siege; but after the garrison had been devastated by cholera and food supplies had depleted, the town was surrendered to General Mouravieff in November 1855. The fortress was again stormed by the Russians in the Battle of Kars during the Russo-Turkish War, 1877-78 under generals Loris-Melikov and Ivan Lazarev. Following the war, Kars was transferred to Russia by the Treaty of San Stefano. Kars became the capital of the Kars Oblast (province), comprising the districts of Kars, Ardahan, Kaghisman, and Oltu,which was the most southwesterly extension of the Russian Transcaucasus. From 1878 to 1881 more than 82,000 Muslims from formerly Ottoman-controlled territory migrated to the Ottoman Empire. Among those there were more than 11,000 people from the city of Kars. At the same time, many Armenians and Pontic Greeks (here usually called Caucasus Greeks) migrated to the region from the Ottoman Empire and other regions of Transcaucasia. According to the Russian census data, by 1897 Armenians formed 49.7%, Russians 26.3%, Caucasus Greeks 11.7%, Poles 5.3% and Turks 3.8%. 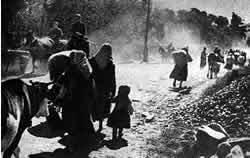 Armenian civilians fleeing Kars after its capture by Kâzım Karabekir's forces. In the First World War, the city was one of the main objectives of the Ottoman army during the lost Battle of Sarikamish in the Caucasus Campaign. Russia ceded Kars, Ardahan and Batum to the Ottoman Empire under the Treaty of Brest-Litovsk on March 3, 1918. However, by then Kars was under the effective control of Armenian and non-Bolshevik Russian forces. The Ottoman Empire captured Kars on April 25, 1918, but under the Armistice of Mudros (October 1918) was required to withdraw to the pre-war frontier. The Ottomans refused to relinquish Kars; its military governor instead established a government, the Provisional National Government of the Southwestern Caucasus, led by Fahrettin Pirioglu, that claimed Turkish sovereignty over Kars and Turkish-speaking regions as far as Batumi and Alexandropol (Gyumri). Much of the region fell under the administrative control of Armenia in January 1919 but the pro-Turkish government remained in the city until a joint operation launched by British and Armenian troops dissolved it on April 19, 1919, arresting its leaders and sending them to Malta. In May 1919 Kars came under the full administration of the Armenian Republic and became the capital of its Vanand province. Skirmishes between the Turkish revolutionaries and Armenian border troops in Olti took place during the summer of 1920. In the autumn of that year four Turkish divisions under the command of General Kâzım Karabekir invaded the Armenian Republic, triggering the Turkish-Armenian War. Kars had been fortified to withstand a lengthy siege but, to the astonishment of all, was taken with little resistance by Turkish forces on October 30, 1920, in what some modern scholars have called one of the worst military fiascoes in Armenian history. The terms of the Treaty of Alexandropol, signed by the representatives of Armenia and Turkey on December 2, 1920, forced Armenia to give back all the Ottoman territories granted to it in the Treaty of Sèvres. After the Bolshevik advance into Armenia, the Treaty of Alexandropol was superseded by the Treaty of Kars (October 23, 1921), signed between Turkey and the Soviet Union. The treaty allowed for Soviet annexation of Adjara in exchange for Turkish control of the regions of Kars, Igdir, and Ardahan. The Treaty of Kars established peaceful relations between the two nations, but as early as 1939, some British diplomats noted indications that the Soviet Union was not satisfied with the established border. After World War II, the Soviet Union attempted to annul the Kars treaty and regain the Kars region and the adjoining region of Ardahan. On June 7, 1945, Soviet Foreign Minister Vyacheslav Molotov told the Turkish ambassador to Moscow Selim Sarper that the regions should be returned to the Soviet Union, on behalf of the Georgian and Armenian republics. Turkey found itself in a difficult position: it wanted good relations with the Soviet Union, but at the same time they refused to give up the territories. Turkey itself was in no condition to fight a war with the Soviet Union, which had emerged as a superpower after the second world war. By the autumn of 1945, Soviet troops in the Caucasus were ordered to prepare for a possible invasion of Turkey. Prime Minister Winston Churchill objected to these territorial claims, while President Harry Truman initially felt that the matter should not concern other parties. With the onset of the Cold War, however, the United States came to see Turkey as a useful ally against Soviet expansion and began to support it financially and militarily. By 1948 the Soviet Union dropped its claims to Kars and the other regions. In April 1993, Turkey closed its Kars border crossing with Armenia, in a protest against the capture of Kelbajar district of Azerbaijan by Armenian forces during the Nagorno-Karabakh War. Since then the land border between Armenia and Turkey has remained closed. In 2006, former Kars mayor Naif Alibeyoğlu said that opening the border would boost the local economy and reawaken the city. Despite unsuccessful attempts to establish diplomatic relations between the two countries in 2009, there remained opposition and pressure from the local population against the re-opening of the border. Under pressure from Azerbaijan, and the local population, including the 20% ethnic Azerbaijani minority, the Turkish foreign minister Ahmet Davutoğlu reiterated in 2010 and 2011 that opening the border with Armenia was out of question. As of 2014, the border remains closed.